Medicine wheels are typically constructed by laying stones in a particular pattern on the ground. 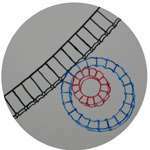 Most medicine wheels follow the basic pattern of having a center of stone(s), and surrounding that is an outer ring of stones with "spokes", or lines of rocks radiating from the center. They were used to gather information, for healing and for connecting with different energies present in our environment. Medicine wheels are not all the same, and reflect the knowledge and use of the people who built and are still building them. The medicine wheel is basically a human invention, an effort to structure the cosmos around us, and to classify all the different beings it harbors. Some people use special rituals when using the medicine wheel, but you can make your own. What is necessary is a clear mind, clear intent, strong visualization, and strong energy from the depth of your heart. A cluttered mind will make your message garbled, unclear intentions will leave the recipient puzzled about what you really want, weak visualization will send out a message with scrambled letters, and weak energy will not even deliver it. Time and patience also plays a role. We are part of a complex cosmos full of life and full of interactions. Other beings, realms and laws are part of our life. Realizing this can make our lives so much more meaningful. 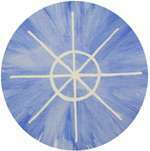 The different sections of the medicine wheel are like gates which you can open to access the energy behind it. Know that sometimes you can do no more than open the door and invite the energies into your life or into the work you are doing. Beings which are more spiritually evolved usually will only help when they deem it appropriate. When you contact the energies behind those gates, always be respectful and responsible. Don't let yourself be limited by one tradition or another, or by what you read. Here you can find my own interpretation of the medicine wheel, based on my esoteric background and experience. I have tried to give you information, for each of the section, that is not so well known, making it a bit more interesting than the main stream medicine wheels. However, don’t limit yourself to it. You have to find your own interpretation, information and energies you work best with, what resonates with who you are. I have made a set of cards out of the digital collage images I made for this article and which you can see below in the right column. There is only one set of cards available. 22 cards in total. The cards are professionally laminated. The backs of the cards are white. The size is 3 3/4" by 5". The set comes in a nice fabric pouch. Nice visual aid to work with the medicine wheel, or for meditation. Price: $ 20 plus shipping. Only USA addresses. No international shipping. Click on the sections in the following picture to go to the corresponding text, or just go down the column below..
Called the Great Spirit by the native Indians, and with many other names by other people, in the center of all is that which has no name, it cannot be described or understood. All our terminology is an approximation of that which brought forth the immense cosmos and numerous beings. For as much as we can talk about it, the Great Spirit is perfect, invisible, eternal. We can only comprehend the Divine in term of duality, and therefore it is often seen as a dual being, the Father-Mother. Some religions have put emphasis solely upon one aspect, and called it the Father or the Mother. 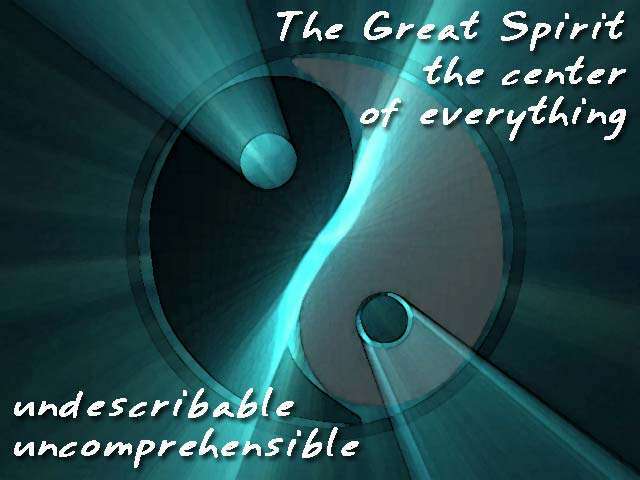 Others who have tried to transcend this duality, have used terms of negation to describe the Great Spirit; it is incomprehensible, unlimited, undividable. It was also called the Depth, the Abyss, to give to idea of something too deep to fathom, something that was too profound to grasp. Be silent, and ponder, ask yourself what is that Great Being that brought forth all that is created and uncreated, that brought light into the darkness, gave birth to all those numerous beings? Feel the Divine both in yourself and outside in the world. What makes you alive, what makes you the way you are, what is the essence of it all? This cannot be reasoned, it cannot be talked about. Just go out into the world and feel it, deeper and deeper and deeper. Let go of what you think you are and be divine. What does it mean to be human? Although the human body is animal in nature, and therefore we have partly animal characteristics, we have qualities that are very distinct from animals. The basic human quality is that one has developed the sense of individuality, an "I" to distinguish oneself from others. This "I" or ego is not yet perfect and thus we have to continue to find our way by effort, error and illusions to finally arrive at wisdom. With the development of the ego also came the development of the higher feelings, although it is clear from the present state of society that man still has a lot to learn in this regard. Man is conscious not only of himself, we can become conscious of our inner Divine Self, that part of us that always remains and shares directly in the divine energy. Man has the unique ability to communicate, create and improve his environment, situation or being in this physical world. Mankind also has a shadow side. Having lost connection with the spiritual beings who guide humanity, he makes mistakes and by that is able to do great evil. "Ignorance is the only darkness". Uneducated, humans will revert back to the animal level. By lack of the proper education, knowledge and wisdom, he can cause great harm to himself, his fellow humans and to other realms of nature. Man carries a great responsibility, but he does not always know it. Think about it, what does it mean to be a human being? Well, in the first place you have to survive. When you don't breathe, eat or drink, you die, it is that simple. Second, you are man or woman, this means you experience life through one or the other gender. You are also able to form relationships and express love. Thus far we share these characteristics with animals. What makes you really human is your ability to create. Have you been creative in your life? Everybody has some talent. Why waste it? As a human being you also have the ability to think, to form ideas, abstract concepts, and solutions to problems. 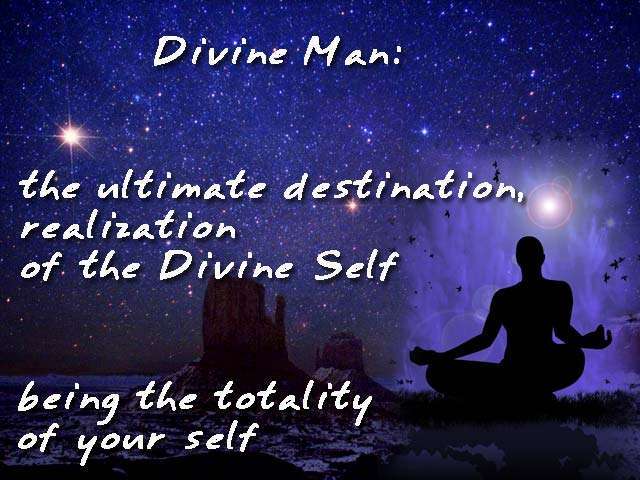 At the top of all this you can become aware of yourself, and of your inner divine nature. Once in a while, stand still and reflect upon yourself as a human being, and what it means for you in this life, and how you relate to the outer world. The Higher Self is often seen as something separate from a lower self. But that is just a way of perception. As long as we live in duality, we can only speak in terms of duality. So man is seen as a two-part being: one who as a silent seer observes in detachment (the Higher Self), the other who in the phenomena of ego yields to the creative play of life. These are actually two levels of consciousness that co-exist. 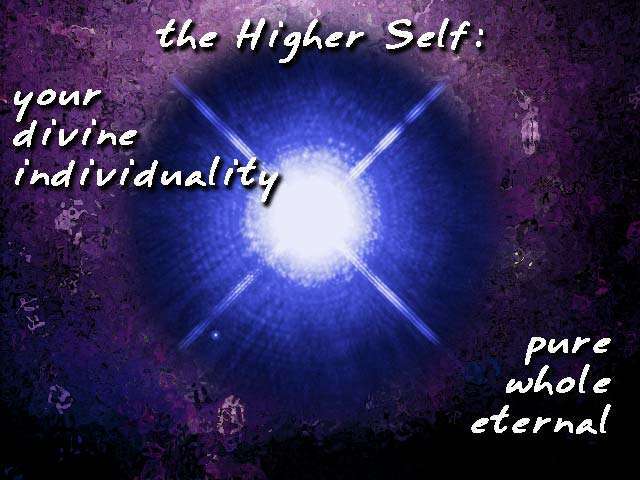 The Higher Self is the eternal point of consciousness and is pure unity. The phenomena of ego is composed of mind, senses and action, yielding to constant change and impulses. The Higher Self has no boundaries, no limitation. It retains its wholeness and purity throughout eternity. What we call the Higher Self is what we really are, in the depth of our being. The phenomena of ego shatters our perception of our inner wholeness and makes us see life as an accumulation of disjointed images. The Higher Self, as what we really are, is a divine individuality. It is not out there in the heavens or somewhere else, but right here and now. Divine nature is not far away in some remote spiritual region, it is right here, all around us. Likewise your Higher Self, which is of divine nature, is right inside you, actually it is you. Why do we not experience the Higher Self? It is because our consciousness or attention is always directed outwards, to other people, to objects, situations, to the world. Shifting your attention inwards will bring you more in contact with the Higher Self, providing that you direct your attention to your divine self. According to the yogis, the Higher Self resides in the center of Sahasrara, the thousand petal lotus, also called the crown chakra. It is perfectly pure and can be seen by anyone, whether enlightened or ignorant. The Higher Self is pure and changeless, and it is because of it that we are alive. The duty of human beings is to remember the Higher Self in the midst of all activities. I have read about and done exercises to come into contact with the higher self, or to let the higher self speak through oneself. But I have noticed they are all based on the illusion that the higher self is something out there, above us, or somewhere deep inside. It is better to realize that the higher self is actually you. You have to get rid of that separation between your 'lower ego' and the 'higher' self. It is a question of how you attune your consciousness. Normally, by habit, it is tuned to every day concerns. We call that a normal, every day consciousness, with it you see yourself as an ego, an individual separate from the divine. Tune your consciousness, or awareness, to your divine center. People call it the higher self, but it is still you. Now you will have a pure, clear consciousness that is absolutely aware of itself, In reality this is as it is, unencumbered by our every problems and affairs. The higher self is a state of awareness that we rarely or never experience because we too busy pursuing the illusions of the material world. The best way to experience your higher self is to silence your body, emotions, and thinking, allowing you to be aware of your true self. It might take a long time and a lot of practice, but everybody is able to do this. Don’t we all want to know where we came from? 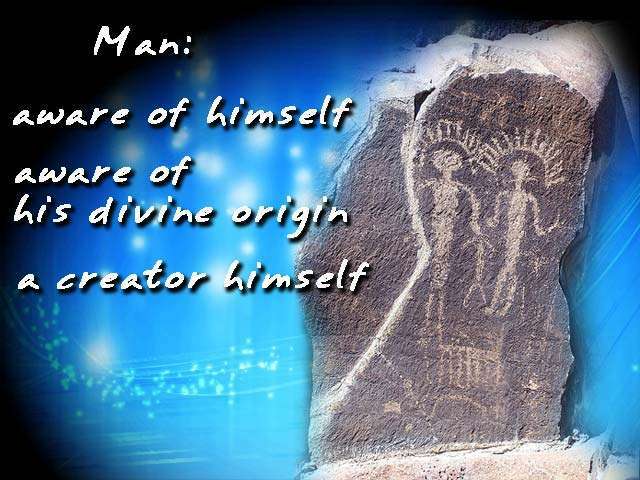 Well, ultimately we came from the divine source, but how did humanity come into existence? Scientists previously told us that humanity was only a couple of thousand years old, now they have extended it up to 2 million. They also now tell us that humans did not evolve from apes, but that apes seem to have evolved separately. Ever more evidence is found, but often ignored by scientists, that humanity was already here at the time of the dinosaurs, which implies that humanity must have come from other cosmic regions. In any case, humanity must be very old, and thus has gathered a lot of knowledge and wisdom, the essence of which is stored in our collective unconscious. It is just a question of being able to tap into it. As humans we must realize that the world we perceive is an illusion in the sense that it is not as we think it is. Humanity must break through the veil that clouds the inner, divine light behind it, which is the only reality there is. The visible is a mere reflection and we tend to loose ourselves in that reflection, not understanding that we created that reflection in the first place. Looking at the Reality behind the veil of the world, we will discover what the true evolution and purpose of humanity is. In contrast with animals, we, humans, do not need elemental support (from a deva) on the emotional or intellectual level, but we do need such elemental support for the energetic and physical body structures. The individual human soul would be incapable of dealing with physical matter if a deva would not help him in dealing with physical energies. Apparently long time ago the devas committed themselves to support and assist the human souls in their physical incarnations, so the humans could go through the necessary experiencing of matter for the sake of their development. Since then each incarnated soul is accompanied by an elemental which resides within the emotional/energetic structure of the human body. This human deva helps the soul to experience everything it has set out to learn during its incarnation in matter. Even before conception the soul connects with a particular elemental which then manifests exactly the right conditions for the soul’s incarnation, and even for the right moment of conception. Later on, the human deva also directs the formation of the body in the womb, and controls all the physical transformations throughout the person’s life. Humans used to have rituals, now largely abandoned, for the transition of one phase of life to the next. This would signal the human deva to actively support the development of a new process. But by lack of these rituals today, the synchronization between the human and its human deva is getting lost, also partly because we have lost knowledge of human devas. The resulting disharmony results in a loss of order first on the emotional level, then on the energetic level and finally on the bodily level expressing itself in physical illness. How do you feel being a member of humanity? Humanity is one of the intelligent life forms in the universe. Long time ago a group of souls decided to go through the evolution of humanity. I have already explained what it means to be human, but you are also a part of humanity and that implies that you are also partly responsible for what humanity as a whole does. The collective unconscious is formed from all the good and bad deeds humanity has ever done and is presently doing. Each of us takes part in it. Thus, being a human, you automatically have the collective unconscious in you, it makes you prone to all the thought, emotions and actions that humanity is capable of. When functioning as part of a group, an individual person is more likely to engage in action it would never do alone. Look at demonstrations that turn violent. Or, in a group meditation you may be able to feel more connected to the divine. Do you feel proud to be a human, or ashamed? Do you care about your fellow human beings, each and every one of them? What do you do to help them? Do you remember that each and every one has that divine spark within, no matter how far from it they have strayed? The advantage of belonging to a group of intelligent beings is that they can help out each other. When you are in trouble, others will help you, but that also implies that you help them. It is a two-way street. If you isolate yourself, you will be less likely to get help from others. Here is the ultimate destination of man. Having realized every aspect of himself, he has become once again what he once used to be: completely conscious of his divine being. But there is a difference, now he has gone through his human evolution and has gained tremendous experience in the cosmic worlds. He has transformed the darkness that bound him to lower existences into light. He has become enlightened, he has become liberated. His consciousness has joined the divine consciousness. He has reached the point where alpha and omega meets. You may think that you are still far away from enlightenment, but that should not withhold you from working on yourself. It is good to remind yourself constantly that in essence you are connected to the divine and that you are a complete being. Even though you haven’t realized it yet, bringing forth the divine energies will stimulate your spiritual development. I guess you are not enlightened yet, am I right? On the medicine wheel the place of the Divine Man is where one has thrown of the burden of the material worlds and has realized his true divine nature. As most of us are not there yet, it is good to constantly remember what our ultimate goal as a human beings is. This will activate the divine energies in you and speed up the process of your spiritual path. So, meditate on this place of the medicine wheel to keep your connection to your divine center, your divine being, with pure, clean and unspoiled consciousness. It is that which you have always been, presently are, and always will be. It is the place where you will tie the beginning to the end, the alpha to the omega. 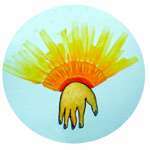 The difference of the position of the Higher Self and the Divine Man in the medicine wheel is that with the latter, one has made an active and lasting connection with the divine. The ego has been dissolved and the sense of self has been completely filled with the energies of the divine, the Great Spirit. The earth is a planetary body upon which we are living. In the last decades much attention has gone to the biosphere in which all living organism are dependent on each other and form a delicate balance, now being destroyed by man’s egotistic actions. The earth is more than just a home, it's a living system and we are part of it. In the last decades this system has been named Gaia. 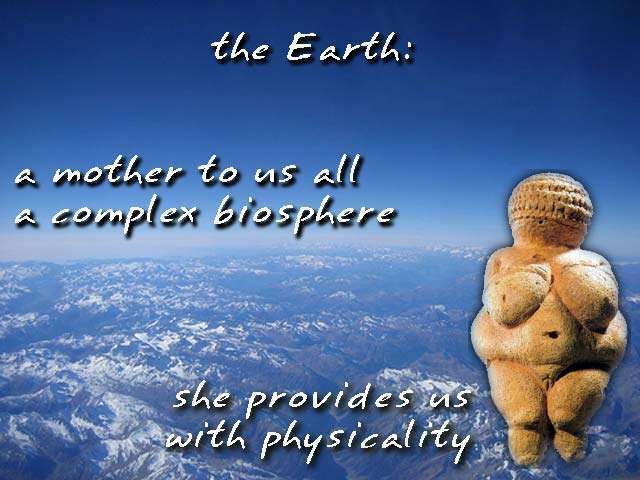 Gaia is seen as a complex entity that makes Earth into a viable and protective environment to sustain life forms. People walk over the earth and it is a conglomeration of rocks and stones to them, but men must learn to grasp that all surrounding them is the true physical expression for the Spirit of the Earth. Just as the body is ensouled, so is the earth planet the external expression for an indwelling spirit. The spiritual person must educate himself to see in each single flower in the meadow he crosses, the outer expression of a living being, the expression of the Spirit dwelling in the Earth. Some flowers seem to be tears, others are the joyful expression of the earth's Spirit. Every stone, every plant, every flower, all is for him the outer expression of the indwelling Earth Spirit. The Spirit of the Earth has a different task. It has the task of bringing the earth itself into mutual relation with the other heavenly bodies in the environment, to direct it and guide it, so that in the course of time it may come into the right relations to the other heavenly bodies. The Spirit of the Earth is, as it were, the great sense-apparatus of the earth, through which the earth-planet enters into the right relationship with the Cosmos. 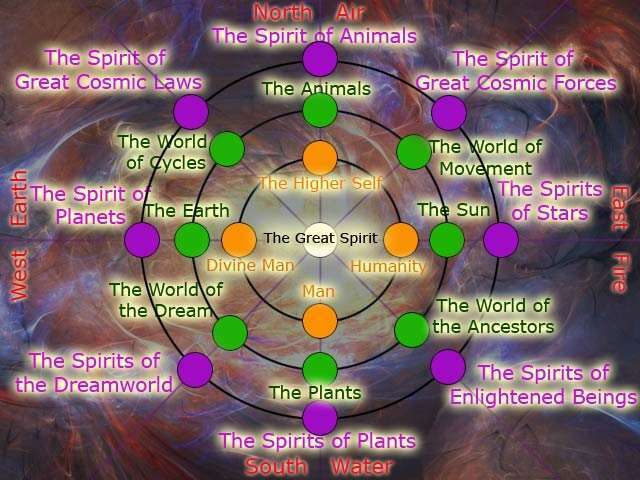 The Spirit of the Earth is a planetary being that forms the personality of the earth. It develops from the experiences all beings on the planet. Thus it is formed from past experiences and does not contain anything from the future. It appears that the 'Christ Being' has now become the actual 'Spirit of the Earth,' having united Himself with the Earth, or with the former Spirit of the Earth. In order to understand nature, to understand how to work with nature, to understand how to work with each other we must come to understand how Christ lives and works in all of the Earth, in all of nature. The Earth can still be seen as Mother Earth, as pagans and wiccans do, but it now time to pay attention and experience the higher forces working in nature. Most pagans and wiccans work with the lower forces of nature, minerals, plants, animals, passions and desires. Now that Christ has spread its energy on Earth, human beings now have the ability to reach higher and enter into contact with those higher spiritual forces that work through and maintain the existence of Nature on earth. Placed opposite from the sun in the medicine wheel, we find the sun represents the heavens above, the earth is opposite and is what is below. We humans are in the middle. One should also note that the gnomes are spirits of the earth. Bring the energy of the earth up through your feet, through the base of your spine, and maybe also through the hands. Holding a stone or a crystals might improve your connection. Feel how the rocks give support and stability, how the soil nourishes the plants. Stretch your awareness from your present spot out to your environment. Stretch out further and encompass your entire village, country, continent, out to the entire globe. Feel the entire planet buzzing with life, and how you are a part of it. Go for walks in nature, and be aware of the ground you are walking on and what is underneath it, be aware of all the different life forms living their busy lives around you. Smell the smell of the forest floors, of the meadow, of the flowers. Where sun and earth meet, plants grow, given the right conditions of course. Plants are beings which are far behind us in evolution, in between minerals and animals. They have a diffuse consciousness, like a deep sleep, not concentrated or focused as we humans have. Plants are essential to our existence. We need them as nourishment, but they also serve as medicine. 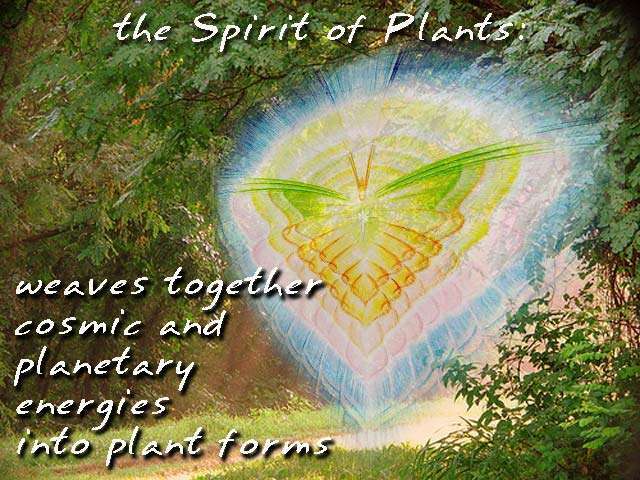 Plants bring many ways balance to the physical and emotional body of man. Each plant comes into connection with the extraterrestrial universe, particularly at certain seasons of the year when spirit-currents flow in from above, from the blossom and the fruit of the plant down into the roots below, streaming into the earth. And just as we turn our eyes towards the light and see, so do the root-spirits turn their faculty of perception towards what seeps downwards from above, through the plant into the earth. What seeps down towards the root-spirits is something which the light has sent into the blossoms, which the sun's warmth has sent into the plants, which the air has produced in the leaves, which the distant stars have brought about in the plant's structures. The plant gathers the secrets of the universe, sinks them into the ground. Just as we find the roots busied about, woven-about by the gnome-beings in the vicinity of the ground, observing with pleasure the upward-striving direction which they give, the elemental beings of the water, the undines, are in connection with the leaves. During the growth process, the plant comes into another domain, that of spirits living in the airy-warmth element. As the gnomes are of the earth element, the undines are of the water element, and the sylphs are of the air element. After it has passed through the sphere of the sylphs, the plant comes into the sphere of the elemental fire-spirits, the salamanders. These fire-spirits are the inhabitants of the fire element. When the warmth of the earth is at its height, or is otherwise suitable, they gather the warmth together. Just as the sylphs gather up the light, so do the fire-spirits gather up the warmth and carry it into the blossoms of the plants. Realize fully that you need the plants to survive. Every meal you eat was prepared with plants. So you should have the utmost respect for plants. When you go for a walk in nature, stand still and look at the plants around you, feel what they feel. Pay attention not only to the trees, but all the small plants around you. Depending where you are there can be a multitude of plants. Don't forget the moss you are walking on. Have a closer look how those tiny plants are growing. 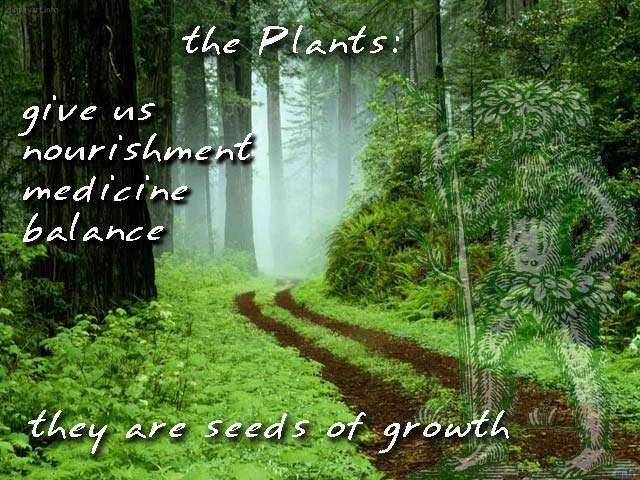 Cultivate a garden, and look at it as a community of plants, helped along in their growth by the nature spirits. Try to feel the different energies of each species, and how their energies contribute to the atmosphere of your garden or your property or the landscape. If you live in an apartment, get some houseplants. They don't have to be exotic. Get the ones you really like and give them the appropriate sun and nutrients. Certain vegetables and herbs can also be grown in pots indoors. Working with herbs is another great way. Learn when the energies of the herbs are greatest during the day and during the year. Harvest them at the best time and use them for health and enjoyment. Animals are the next step in evolution. Their consciousness is clearer than the plants and more focused to their immediate environment, but they still do have a very good sense of the astral or emotional level in their environment. At the same time animals are good in ‘psyching’ you out, that is they can feel what your emotions or intentions are. Man always had a close relationship to animals. Primarily for food where agriculture did not exist or was not enough to sustain man. But animals were also domesticated for other benefits, like dairy products, their hair (sheep), protection (dogs), control of rodents (cats), or for their comfort as pets. We should always be nice to animals as their spirits can affect our well being. The spirit of a mistreated animal can turn against its abuser. Or a well treated animal can become a power animal. I am sometimes asked if animals have an individual soul or a group soul. Well, they have both. 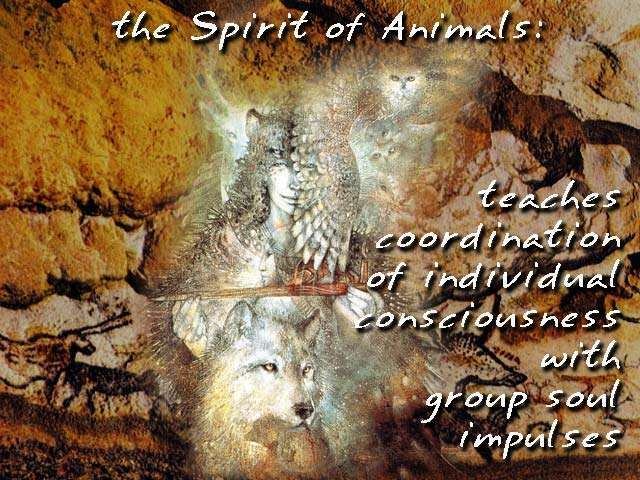 An animal is under the influence of the group deva of his species, but it is an individual being, that is it has a divine spark, an individuality and a personality that sets it apart from the other members of his group. The animal is an individual entity but it has a little developed ego, or sense of itself. In other words, the self-consciousness of an animal is very limited. On the energetic level, each of the animal species have a specific function and task in their relationship to the earth and to the landscape. Some regulate energetic tensions within an area, others look for the connection between the earth and spiritual spheres. For example, a mole rubs its fur against layers of earth, causing a build-up of power. The generated power becomes part of the earth’s magnetic field. Fish, through their swimming balance the positive and negative charges in water, so harmonizing the energetic structure of water. Birds open us channels on the physical plane which allow cosmic powers to pour in. If you have a pet, look straight into the eyes, and you will know that animals are much kinder than humans. Their eyes are all giving. We not only take care of them, but they also take care of us, although we do not always see that. They like to please us and give their comfort and energy. They have a lot to give us if we are open to accept it. When the first settlers came to America they were surprised that the native Indians used to go up to the wolves' den and play with the cubs. There is a story of a wounded hiker who's dogs went out and brought back the right herbs to treat his wounds. How do you open yourself to animals? Let down your fears and misconceptions, and open yourself to their particular energies (according to their species). The first and major component is trust. Animals can feel what you feel, so you have to be very aware of your emotions. You have to learn to both feel your emotions and see where they will lead you. Emotions are a major stumbling block for people. Realize that you too are still half animal. A human has a mammalian body, and thus animal instincts and passions. Animals are our brothers and sisters who way back in evolution got behind and had to choose animal bodies for their evolution. So, learn to see them in this light. Sometimes it looks like mankind is behind in evolution when you see what humans do each other. So learn to look at animals as you still can learn a lot from them. Don’t we all like the sun? When the clouds are gone and the sun breaks through, it uplifts our mood. The sun has been worshipped in all religions, because it is such an obvious source of light. Even Christ was identified with the sun. The sun created our entire solar system. With the birth of our solar system, cosmic dust came together to form a ball of glowing mass which would throw out the planets in different stages. 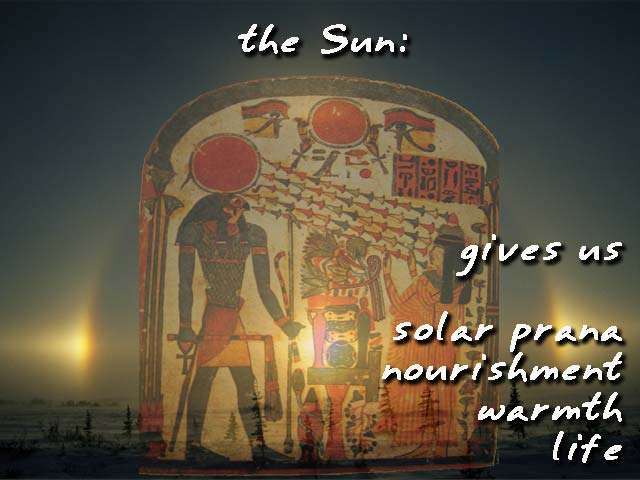 The sun warms the earth and give it light to sustain and nourish the life forms. The sun also emits solar prana, which the body absorbs continuously for the nourishment of both the ethereal and the physical body. Prana is the vital link between mind and body, because energy is the very basis of life and vitality. Solar prana is that vital and magnetic fluid which radiates from the sun, which is transmitted to man's ethereal body. It helps to keep the body in good order and functioning correctly. Go sit in the sun. When absorbing the sun’s energies I like to sit in the Egyptian posture. When you look at the statues of Egyptian royalties you can see that they always sit in the same position. The ankles, the knees, the hips are all bend in a 90 degree angle. Hands rest on the knees, spine and head are straight. This promotes an optimum flow of energy through the body. Of course, take a position you feel comfortable in, do not force it. Facing the sun , feel its warmth, its energy, penetrating and filling your body. Remember that the sun keeps everything alive. Also see how the sun makes plants grow, makes crystals sparkle, and makes people happy. Be aware that your solar plexus (hence the name) takes up a lot of solar prana. When bathing in the sun, feel that your body is relaxing, as the warmth of the sun’s rays makes every cell of the body relax, something we need so much in our present time. when it is winter if you can make a little room behind a south window in your house, so you can sit in the sun when it is too cold outside. The civilized world has forgotten what the world of the dream is about. "It was just a dream" is an all too often repeated phrase. It is time to realize again that the dream is an integral part of our existence. We spend about one third of our lives sleeping and a good part of it in dreams. Dreams have a psychological function in the sense of balancing our personality by rectifying what we did or did not do during the waking hours. But dreams can be more than that. 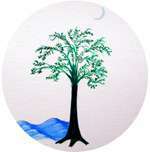 For the spiritual person, dreams can give clues, messages, signposts for his spiritual path. In dreams, deceased family members or spiritual guides can appear communicating thoughts of love, warnings, or wisdom. Dreams can give access to past live experiences. 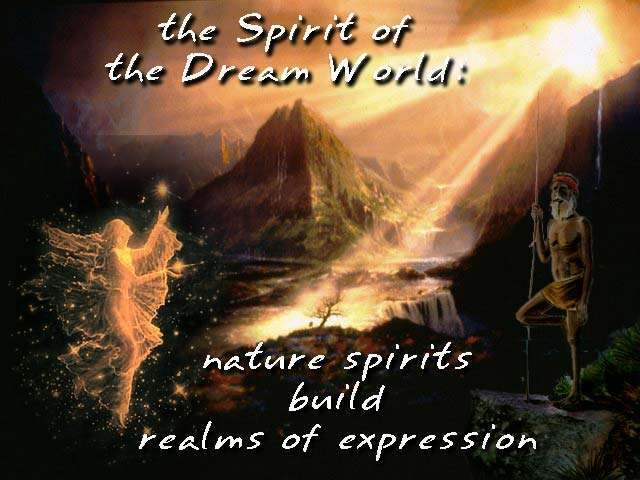 Understanding the dream world helps us to grow spiritually and increases our spiritual perceptibility. For shamans and other spiritual practitioners, dreams were not a separate kind of "thing". The dream world was closely interwoven with every day reality. It is an astral realm where one can transform into animal forms, fly through the air, go to any place or any person, and gather knowledge or power. 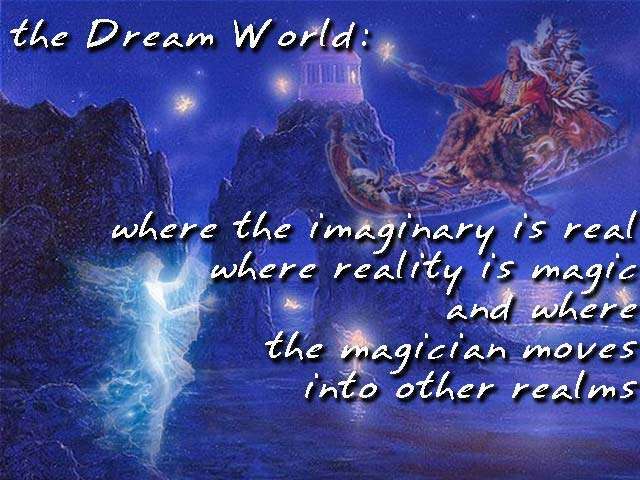 The dream world is a reality with different rules, were myths come to life, and magic is born. The best way to explore your dream world is to do dream work. Put pen and paper next to your bed, and before you go to sleep repeat to yourself (until you fall asleep) that when you wake up you will remember every dream in all details. When you wake up write down your dream immediately, in full or in as many keywords as possible. Later in the day you can write your entire dream in every detail in your journal, with a possible explanation. In the beginning you will hardly remember any dreams. But after a couple of weeks you will be amazed about the amount of dreams you are able to remember in one night. You will also be amazed about the kind of dreams you have. Often you will be ashamed of certain actions, but there you have the real dream work. If, for example you are threatened by a dream person, then during the day, you have to go over your dream but change it into a positive outcome. In this case, in the process of reconstructing the dream, you confront the person and make sure that you are the victor. "Creative Dreaming", a book by Patricia Garfield, can help you a lot in this regard. There is no people that has not or is not honoring their ancestors in one way or another. Although they are not physically present anymore, we feel that their spirit is still alive, and that they can impart their knowledge, power and wisdom. Because of these characteristics, they watch over us as guardians and helpers. There is also a physical side to the inheritance of our ancestors, especially within a family. Persons who experience no more than what is perceived by their senses remember no more than the events connected with those outward sense-experiences. They can only be aware of such things as may have been experienced in this way since childhood. But with prehistoric man the case was different. Such a man sensed what was within him, and, as this inner experience was the result of heredity, he passed through the experiences of his ancestors by means of his inner faculty. He remembered not only his own childhood, but also the experiences of his ancestors. At one time there was a form of consciousness by means of which men considered not only their own sense-perceptions as their own experiences, but also the experiences of their forefathers. In those times, when they said, "I have experienced such and such a thing," they alluded not only to what had happened to themselves personally, but also to the experiences of their ancestors, for they could remember them. 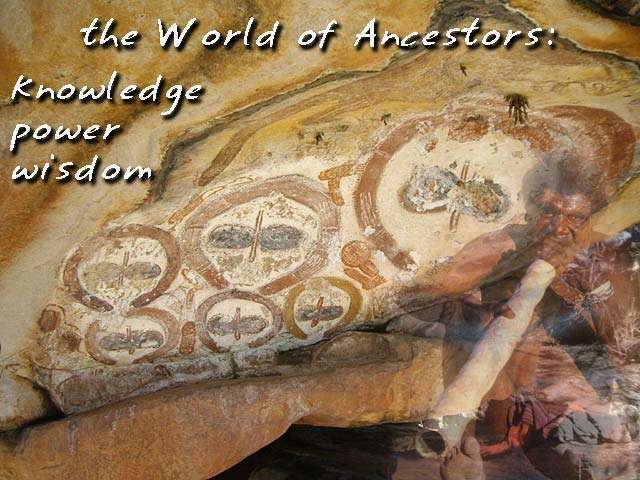 Today our ancestors’ experiences are mostly inherited by certain gifts and talents. For example, the entire Mozart family was extremely gifted with musical abilities. 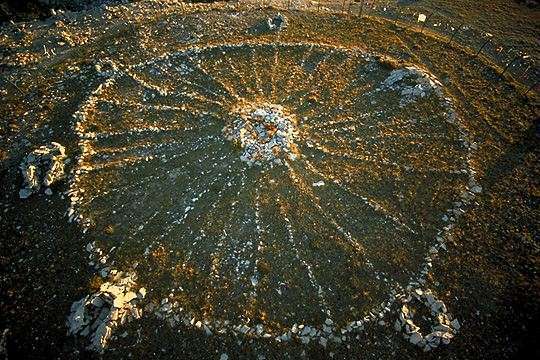 But we still can access the knowledge of our ancestors by visiting such places as stone circles and other megalithic constructions, or ancient sacred sites. What goes up goes down, what is born will die. Everything in the cosmos happens in cycles. Nobody knew it better than the ancient Mayas. Their calendar had cycles within cycles within cycles. There has always been some consciousness among the peoples of the Earth that their existence was influenced by certain cycles of heavenly constellations. The great periods of human civilization are subject to the heavenly cycles as is the movement of the Earth in its relation to Sun and stars. The sun goes up and down, civilization rise and decline. The natural cycles were always important for people. They had many celebrations for the equinoxes and solstices, often tied in with other religious ceremonies. One should also be aware that on subtle levels there are energy changes taking place at these times. Cycles are also well know in astrology. Why is it important to know these cycles? Because each cycle brings with it a certain energy. Knowing what energy is predominant in a given situation can be advantageous. It is like riding the waves on an ocean. When you know a storm cycle is coming your way, you'd better be prepared. This 24,000 equinoctial cycle is divided into 12 periods or yugas. It also goes through the twelve signs of the zodiac, each having its own particular influence on the civilizations on earth. If you think 24,000 years is a long time, think again: the yogis talk about a universal cycle that is 4,300,560,000 years long, and the life span of the whole universe is 14,159,000,000,000 solar years. The best way to explore cycles is to study up on astrology and analyze how certain astrological cycles influence your life. It is also interesting to read about the big cycles of evolution, like the precession of the equinoxes, and the influence of each sign on humanity. The Hindu are well versed in this (read the Holy Science by Swami Sri Yukteswar). 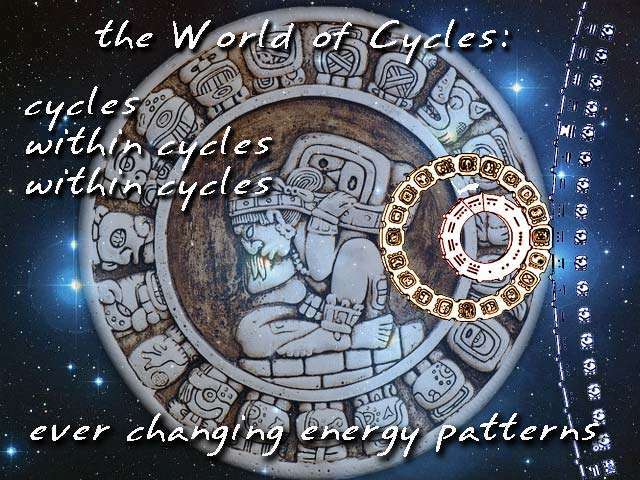 Also the Mayas were masters in calculating many cycles and their characteristics. 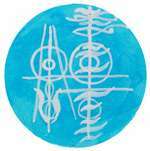 There are also cycles of incarnations, and it might be interesting to get some information about your present and past incarnations by a trustworthy psychic or channeler. It is sure put your life in perspective. 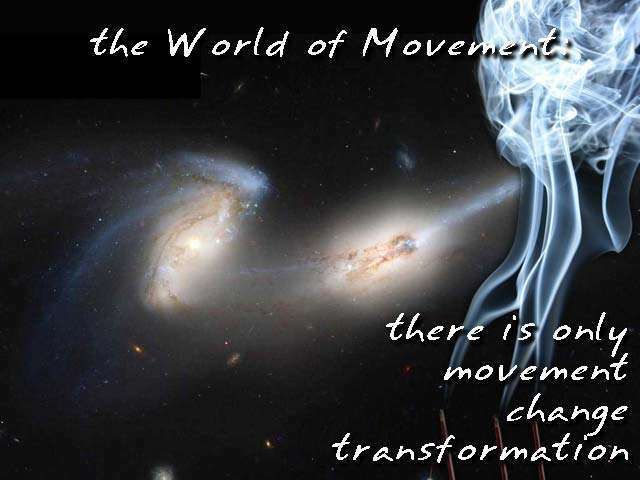 Everything in the cosmos is in movement. We move over the earth. The earth moves around the sun, the solar system moves around the galactic center. Our galaxy moves around a cosmic center. There is not one point that is absolutely still. The first act of creation was movement in space, or space in movement. It is up to the spiritual seeker to find the order in movement, because all movement happens along certain paths, along certain energy lines like the flow of a river through the landscape. A plant grows from seed to flower, it has to grow according to the blueprint stored in the DNA of its seed. Everything moves about in a certain direction. People in the past have intuitively felt it, and talked about ‘fate’ or ‘the will of god’. Most people go along with the natural processes, which go through birth, growing up, sickness, death. But inside us is another movement that will bring us back to the divine. By paying attention to this inner movement the true spiritual seeker is not ruled by fate but creates his own destiny. To help people sort out how the cosmos moves, the Chinese created the I Ching (The Book of Change). I Ching means change, changing in accord with time. Although the I Ching is primarily used for divination, it is actually meant as a frame work for contemplative practices of how oneself or situations are moving ahead according to cosmic laws. By acting accordingly one can live in harmony with the flow of life. This requires an openness and tranquility, a freedom from preoccupation and agitation which allows man to effectively deal with change. One needs to be quite and listen to the flow of nature, because ignoring nature’s way of change only causes resistance, resulting in frustration and pain. Everything moves. It doesn't matter what you do or don't do, things will always move along and change. There is nothing you can do to stop it. So how do you view change in your life? If something unpleasant is about to happen, the natural instinct is to prevent it, and usually if you are unable to prevent it, you get angry. Think about it: if you can't change or prevent it why not go with the flow, at least you will not waste your energy being angry. Everything has a certain flow in life. Practice listening to this flow, to the flow of your own life, that of others, that of the seasons, even of a plant growing. Every community, country, company, everything has a flow of development. Listening to this flow may help you improve your own life, helping you to discover in what direction energy can or cannot flow. There will be no more room for anger, frustration, fear, or failure. It is all about freeing your inner self of blockages, letting life flow freely throughout your being, and attuning yourself to the flow of energies around you. A good way to free the flow of energy in yourself is to pay attention to your movement, to dance, or whirl around like the dervishes. We already touched upon the idea of the spirit of the earth when we spoke about the Earth. Each planet has a planetary spirit, sometimes called a planetary logos, a spiritual being who manifest the planet and all life on it. We also should take into account that the physical matter and minerals of planets are formed by their corresponding devas, spirits, or angels, throughout the universe. They know how to structure cosmic energies in well defined patterns and make them coherent and physical, and thus create all physical matter in the universe, be it planets, moons, asteroids and so on. 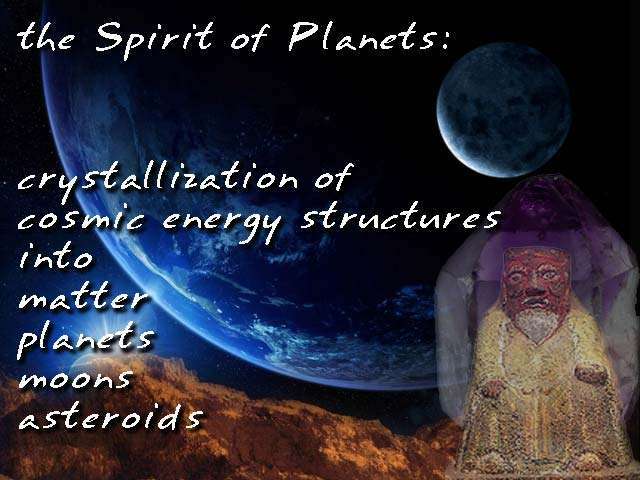 The spirits of planets form all physical matter in the universe. All matter is crystalline and structured in one way or another. You could ask their help in a project to help realize its manifestation, to make it concrete in our physical reality. But they can also help you in realizing the underlying order of the physical universe. Studying quantum physics helps too. There are now books on the market that explain this arcane science in layman's terms. The chaos theory (fractals) is another very interesting subject. Fractals can be seen quite easily in nature. Plant spirits or devas are usually known with their traditional names or appearances: elves, fairies… Like all devas they do not have form, they are more like vortex energies, but they will take the form people like to see them in. 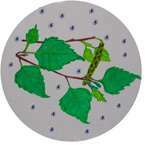 They have awareness of the blue-print of how a particular plant may evolve. Nowadays one could say that they know perfectly what is in the DNA of that plant. They help the plant grow along the information contained in that DNA. But they do more than that, they provide the plant with the necessary energies to grow. They are actually building the plant. There are tiny plant devas that are responsible for only a part of the plant, like the flowers, and devas that take care of the entire plant. They all work together in unison. There also more developed devas that encompass an entire garden or even a landscape. A gardener might as well be aware of the plant devas, as they are always open to work with humans. Being aware of them every time you are in the garden, will certainly attract their attention. A well known example of working with the spirits of plants was Dorothy Maclean, one of the founders of the Findhorn Foundation. In the very beginning of the foundation, they decided to have garden, although the soil was so sandy that it offered scant hospitality and encouragement for the growth of anything other than hardy Scottish bushes and grasses. But through her telepathic contact with the plant devas, she got specific instructions and spiritual assistance. The result was a lush garden with with well developed vegetables and even tropical varieties of plants. You don't have to be a specially gifted person to have results. Be aware that there are spirits and devas which work constantly on the growth of plants, and talk to them. You might not be able to hear them, but their help might come in the form of inspiration, or intuition of what to do in your garden. You certainly can develop a feel for their energies. Also feel the spiritual energies in the woods. They are always there, and if you show them respect, they certainly will be open to communication. Like plants, animals too have a collective spirit, or deva. We usually call them power animals. Learning the qualities of your power animal can help you understand your own emotional energies, as animals act primarily on the emotional level. Animals have a lot of specialized skills, and a power animal thus can help us to develop that skill everyday life. There is a lot of information on the market about power animals, so I will not go further into it. To give you an idea about the power involved. I once read a story of a rattle snake skin. The person who received it developed all the symptoms of a rattle snake poison, it disappeared when he gave it back. However, the spirit of animals can also help us. The group-ego, or deva, of the animal stretches out all over the planet. These group-egos are wise, but one thing they have not yet gotten: they have no knowledge of love. Only in man is wisdom found in his individuality together with love. In the group-ego of the animals no love is present; love is found only in the single animal. What underlies the whole animal-group as wise arrangements is quite devoid of love. In the physical world below, the animal has love; but above, on the astral plane, where the animal devas reside, it has wisdom. 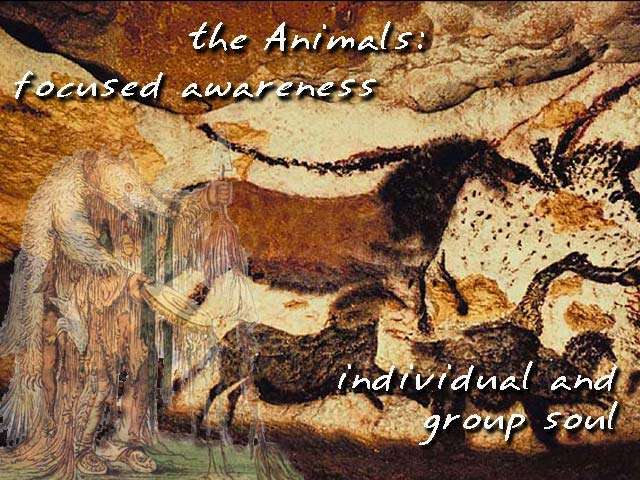 The devas who are associated with the animals try to educate the animals in the coordination of their emotionally polarized consciousness of individuality with impulses from the group soul. This plants a seed within the animals for their future ‘personality’ and their path to individuation. In prehistoric times, man painted animals on cave walls. This was not just for the sake of art. In those times, man still had the ability to psychically leave the physical body. Focusing on the wall painting of an animal, man would go out to the astral world and scout the forests (on the physical plane) for those animals. Permission was asked to kill one of those animals for food. Equipped with this information the hunters of the tribe would go out and find the animals in the described area. The group deva of those animals would allow certain animals from the pack to be killed. Nowadays we don't need to hunt for food and we should not hunt for sport. We still can work with the devas of animals, for example in the garden. Eileen Caddy, one of the founders of the Findhorn Foundation, once contacted the deva of the moles, as her garden was being invaded by moles. The deva of the moles agreed to keep the moles out of her garden, which indeed did happen. Some people have been contacting the spirit of the dolphins, acquiring knowledge and wisdom. There is a tribe on the east coast of Africa that still has a ritual of contacting the dolphin spirit, after which the dolphins appear, driving a school of fish out towards shore, to be harvested by the tribe. All suns or stars are manifestations of star logoi. These star beings are the primary formative forces of our Universe. They not only create the stars themselves but also the solar systems that go with them. They create worlds in which numerous life forms can develop. The star logos is the being who manifested the solar system. Archangels are its helpers and are residing in the central sun or star. Archangels can inhale and exhale warmth, fire, and thus they are called the Spirits of Fire. The highest evolved spirit who was on our sun as Fire Spirit, is Christ who today is still active upon the Earth, with very highly evolved consciousness. The archangels also take part in influencing the form of stars, planets, matter and nature forces. 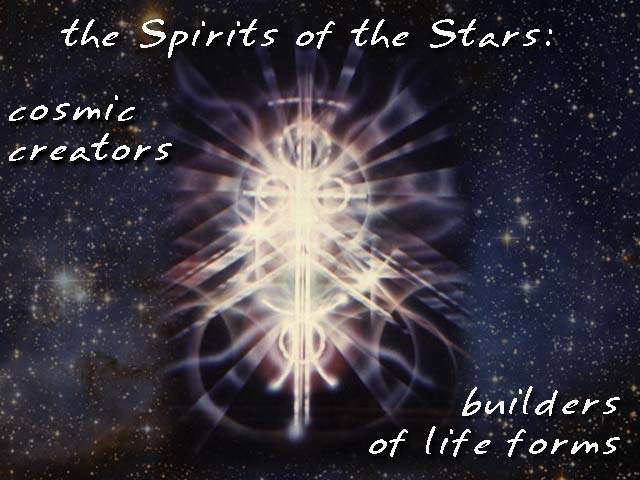 They are called the Builders because they develop every form that has consciousness of life. The solar or stellar logos guides the evolution of the solar system, and the evolution of the races of mankind is connected with the hierarchy of the Archangels. The spirits of stars are the builders of the universe. Study the evolution of the stars, the suns from red giants, white dwarfs, to black holes. It is awesome what happens in the universe, and we know so little about it. As far as I know the star logoi themselves are not that interested in human affairs, although they can transfer knowledge. They are immensely powerful and not easily approached. You can read a little more about them on my Light Beings page. Plants have group consciousness, a central being that governs the existence and growth cycles that particular plant. These beings are generally called devas. For example, the deva of a spruce will govern the existence of spruce trees. Some people are able to contact these devas, as did the original founders of the Findhorn Foundation in Scotland. With the help of devas they were able to grow large and healthy vegetables in poor soil. Devas are astral beings mostly interested in the processes of nature, but they are generally willing to help humans. They can create sounds, music and singing that creates a positive atmosphere both in nature and around humans. Devas are always conscious of their cosmic environment and like to create. They don’t have a need to learn as we humans do, instead they have an instinctive ‘knowing’ of cosmic patterns, relations and harmonies. They live fully in the moment, fully concentrated, in unison with the cosmic energy they are working with. By themselves they do not have a form -they look like vortexes- but they usually do take one when humans interact with them. The devas are the builders of our world. Embodiments of creative intelligence, they wield or transmute energy into increasingly more ‘physical’ structures (including emotional and mental structures), and finally into matter. They hold the archetypal patterns of all form. They build vehicles for for the expression of life on all levels. As builders of life, they have long inhabited our planet. In fact they formed planetary life. As controllers of natural systems and agents for creation’s patterns, they are immensely powerful. Although devas are fully individual, they do not mind loosing their individuality and merging into the whole. The oneness of life is a consciousness in which they happily have their being. When conveying messages to humans, an individual deva may speak, or a host of them, it doesn’t matter to them. 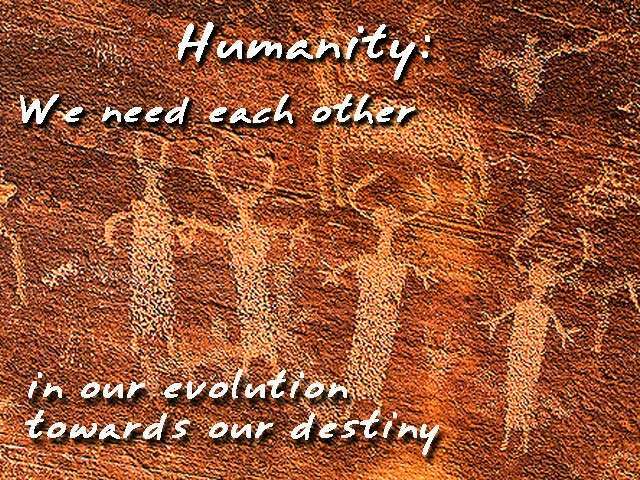 The important difference between Humans and Devas is that we are multifaceted beings, and our evolutionary path is towards the diversity numerous experiences provide, in order to refine the quality of our consciousness This is as opposed to the Devic evolution which is progressing to singular specialization, in order to perfect their form. Man is becoming individual by growing away from the group mind of Humanity, and learning to include all the varieties of his conscious experiences within his own individuality. Some people are naturally gifted in seeing nature spirits. I once met, briefly, an old woman when I visited Findhorn in Scotland. She would go out at night to talk to the nature spirits. More she would not say. There are people who can only see gnomes. I guess it depends what you are tuned in to. Working with nature spirits or devas can be done in many ways. Basically it is a question of tuning yourself to their realm. I have already hinted at working with plant and animal devas in and around the garden. But nowadays a lot of nature and nature spirits need healing for what man has done on this planet. This can be done by singing, dancing, creative imagination, crystals, meditation, rituals. If you are interested in this kind of work, read the books of Marko Pogacnik. 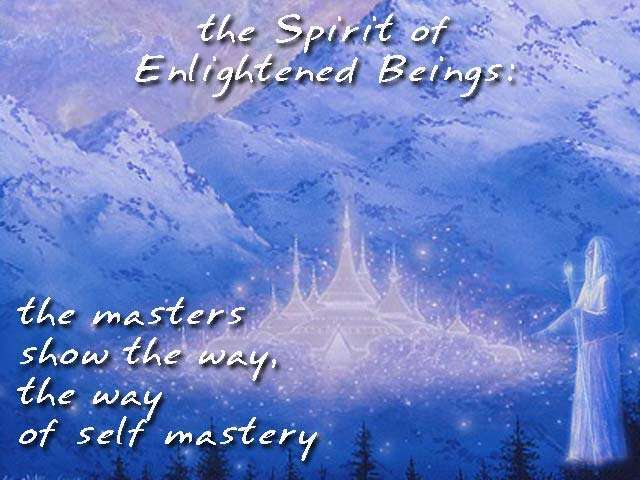 We usually call enlightened beings master, but what does it mean? A master is one who has achieved self-mastery, that is, he masters every aspect on every levels of the being he is. Mastery over oneself also brings mastery over the universe, there is no separation between the beings and the universe they created. Masters are also devoid of the ego-principle and its upward rising personal desires. The divine shines through them, and what they do is for the sake of other living beings, as they have given up all ego-related characteristics. An enlightened being is a being who is completely free from the darkness of ignorance. Enlightened beings can join the Divine and become one with it, or they can renounce this ultimate dissolution into the Source, and become Bodhisattvas in order to help others attain enlightenment. They devote all their power and energy to saving suffering beings in this world. Enlightened beings work on all the spiritual levels of the universe, but they can also manifest in physical form, and thus appear to us. But contact can also happen in heightened state of awareness, as with meditation. Sometimes they appear as Deities, sometimes as humans, sometimes as non-humans. Sometimes they appear as Buddhist Teachers, sometimes non-Buddhist Teachers, sometimes as crazy people or even as seemingly evil people, and sometimes as inanimate objects. Can one ask to come into contact with a master, or ask for his blessings, or a favor? Yes, you can ask, but you won’t always get a reply. First of all your prayer has to be utterly sincere, straight from the heart. Second, if a master decide to help you, help comes more often than not in other ways than we expect. With our limited consciousness we are ignorant of a lot of energies that are at work in our lives. The master has a complete overview of who you are and what you really need. He will help you in a way that is best for you from the divine point of view, or from your higher self point of view. That is often very different than what our little egos want. You should also realize that you too can realize the enlightenment of your own inner being, just as the Masters have done. It might take more time as we all go on our own pace. The enlightened beings do not come on demand. One can ask their help or assistance, but there is no guarantee that they will help you in the way you want. With our limited consciousness we do not have the full picture of our lives, but they do. The enlightened beings know every aspect of our lives and what is best for us from the point of view of the our higher self. If they decide to help us, they will do so in a way that they deem is best for us, and we might not even recognize it. With enlightened beings one cannot hide anything, they can see through all of our facades. Therefore one should examine oneself to see if one's intentions are pure when seeking their help. If you are devoted to a particular enlightened being, make sure you see the divine working through that being, because he/she should not become an idol. An enlightened being is a being who has put aside any ego concept and has become a vessel for the Divine. There are humans around who have attained enlightenment, and they are not always found in the East. They don't advertise, so question the authenticity of gurus who claim to be enlightened and have a large flock of devotees. If and when you are really ready an enlightened being may cross your path. Be aware that you may not at first recognize him/her, as he/she may look like an ordinary man/woman. Cosmic laws are the characteristics of the One Universal Mind in operation throughout the whole universe. Scientists talk about the physical laws of nature, but there are other laws that apply on each of the spiritual planes. When we consider the laws and forces of the universe, we cannot separate them from the beings that embody or personify them. Cosmic laws are actually the expression of Great Cosmic Intelligences. Cosmic laws are merely the nature and behavior of the one Universal Being expressing itself through Its many facets. Everything is governed and controlled by Cosmic laws. These laws are always working whether we are conscious of them or not. The more we know of these laws, the more we will understand ourselves and all life. By knowing the causes of those effects, by tracing the causation of life's manifold manifestation, we may begin to learn the nature of certain Cosmic laws and learn to abide by them, and even apply or tap in to them for our own benefit. By so doing we may overcome or avoid the many unnecessary, excessive hardships and struggles in life. We, in fact, become the co-creators with God, masters of life. By knowing, understanding, and applying Cosmic laws in a positive, constructive, and creative manner we automatically promote our spiritual growth and evolution. Knowing the cause of our problems by understanding the Cosmic laws and principles involved, we learn to take proper control and direction of our lives. In order to fathom or probe the nature of Cosmic laws, or to prove their reality, it would take intense meditation, contemplation, and experimentation upon them. Most of the time acquiring metaphysical knowledge is dependent upon revelation from the Mind of God and the Divine Beings. It does not always depend upon the rational mind of man which is limited in its scope of functioning. Cosmic laws are immutable. They are unchangeable. As Carl Gustav Jung said: "Nature does not forgive", meaning that, for example, when you put your hand in a flame, your hand gets burned. It is of no use to feel sorry afterwards and say that you didn’t know. It is up to us to get information and knowledge as much as possible, so we can avoid unpleasant surprises. This also applies to the greater picture. If you willingly hurt other people, verbally, emotionally or physically, then your higher self, by your conscience, will place you later in life, or in a next life time, in a not so pleasant situation in which you will have to rebalance yourself again. One of the well-known cosmic laws is karma. Karma, as described in the Hindu scriptures, is an equilibrating law of action and reaction, cause and effect, sowing and reaping. Karma is an impersonal, natural law that operates in accordance with our actions. It is a law in itself and does not have any lawgiver. Karma operates in its own field without the intervention of an external, independent, ruling agent. Each man, by his thoughts and actions, becomes the molder of his destiny. Whatever energies he himself, wisely or unwisely, has set in motion must return to him as their starting point, like a circle inexorably completing itself. A man’s karma follows him from incarnation to incarnation until fulfilled or spiritually transcended. If it sounds a bit scary for you, it all depends how you view karma. Understanding of karma can be gained if one lives one's life as if karma was a fact. If a disaster or a sorrow befall you, try keeping in mind the thought that this sorrow or accident has not occurred by some miraculous chance but that there must be a cause, a reason for it. You need not probe for the cause, or try to find guilt or blame. Only he who clairvoyantly can command a view of karma would be able to actually perceive the cause of a joyful event, or of a sorrow or some mishap. You do need a mood, a certain feeling of acceptance to which you can surrender yourself so that you can sense how a given sorrow or joy must have a cause and, in turn, itself can cause future events. He who permeates himself with this mood and looks at his life in this way will find that his existence and experiences become increasingly comprehensible to him. Understanding of karma comes to he who restrains his impulse to anger when something annoying happens and instead remembers that just as a stone rolls if pushed, the annoying matter must have come about due to some inevitable set of laws of the universe. It must never be imagined that one's life is under the sway of an immutable law of destiny. Freedom is not impaired by the law of karma. In studying the law of karma, therefore, the future must be borne in mind as strongly as the past. Bearing within us the effects of past deeds, we are the slaves of the past, but the masters of the future. If we are to have a favorable future, we must make as many good entries as possible in the book of life. Insight into your own karma, and how karma works, is the best you can do in regards to this section of the medicine wheel. When you go through a difficult period, realize that you have to stay in your center. Wailing about bad luck or feeling sorry for yourself will not improve the situation, you will only feel worse. Find out how the situation is working to balance things for you and how you can improve it. Be sensible about, what is possible and what is not. 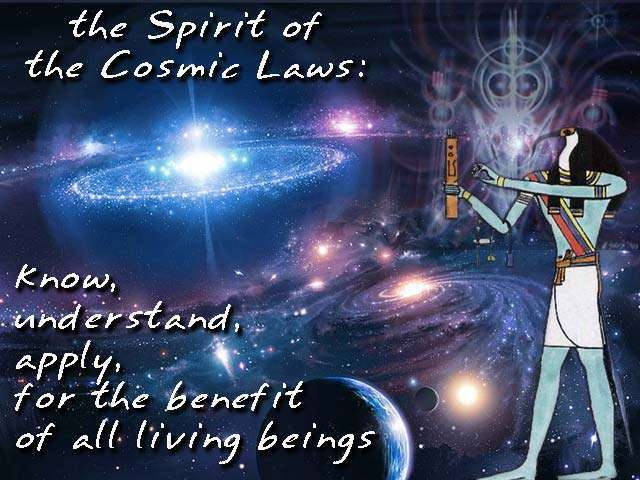 Everything works according to certain laws, physical and spiritual. It is essential to know how action-reaction works in life. Everything you are doing now will create certain effects on many levels. So, it is good to look ahead as much as possible. What kind of karma, or reaction, will you create by your present actions? A good help is to use the I Ching as an oracle, but that by itself requires insight in the working of the energy flows in the universe. Misinterpretations will not help you. Usually they are the result of being blocked and not wanting to accept reality. 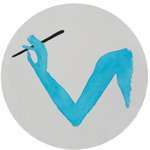 One needs to cultivate insight, intuition, and be prepared to let go of that desire to direct and control everything. The cosmic laws are always working in every aspect of our life. Make use of these laws for your own betterment and that of others. 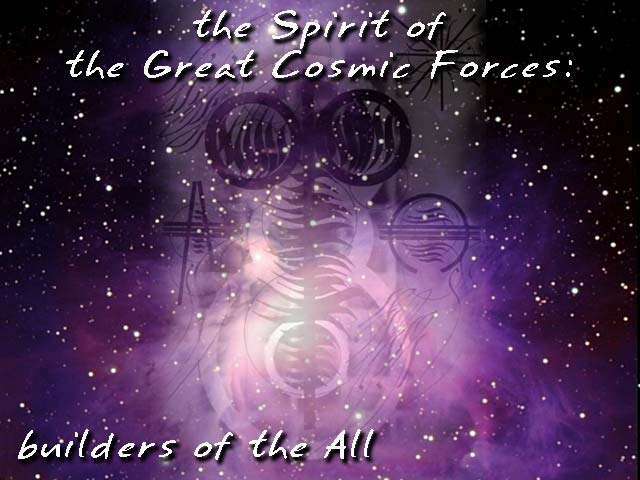 There are many great cosmic beings that work on the structure of the universe, build the spiritual and ethereal worlds, give form to substance and so on. The following are a couple of great beings I thought it be worth to mention. The Great Mother: The Great Mother principle is the cosmic being that gives birth both to the Light and to the phenomenal world. She is the creative force in all nature, the mother of all things. She has unconditional love. The Great Mother appears in many forms and under many names. The Goddess can appear as spouse or sister, but in her form of the Mother she is the best protection you can ever get. As Mother she will always protect an nurture you. Of course you have to be worthwhile by living a pure life, otherwise she will withdraw her protection. Christ: is a highly evolved, totally liberated being, whose light is now encompassing the Earth. Christ is the Light of the Divine, and is often experienced as a brilliant, spiritual sun, the reason why Christ in the ancient mysteries was identified with the sun. Christ also shows us what we too can become like him. Pan: is the spirit of Nature, it is the spirit that penetrates the entire universe, and all beings in it. His name (in Greek) means "the all". In later times, people started to misunderstand this cosmic force and began to see Pan as the lower, animal, sexual energy but that is only one aspect of Pan. Fortunately, people are beginning to see him again as the great cosmic being he is. For those who wish to look a little deeper in other great cosmic forces, they could study the ranks of angels (The first name is from the Catholic tradition, the second name, between brackets, is from the Jewish tradition): Seraphim (Haioth ha Qodesh), Cherubim (Ophanim or Galgalim), Trones (Arailim), Dominations (Hhashmalim), Powers (Seraphin), Virtues (Malakim), principalities (Tarshishim). Powerful as they are, they work on the process of creation. Most of them are rarely interested in individual persons, but if you manage to get their attention, they can be a powerful protection for you. Be sure not to offend them, because the wrath of some of those beings can devastate your life. Like with all other beings in the universe, big or small, always show respect! The Great Mother and Christ are the most accessible. To reach them your life style has to reflect inner purity and dedication to the Divine.